Author: Harry Stroomer. Series edited by: Hans-Jürgen Sasse †. 14 pp. Roman, 315 pp. Oromo belongs to the Cushitic language branch of the Afroasiatic language family. It is, both in terms of geographical extension and in terms of number of speakers, an important African language, spoken as a majority language in the southern half of Ethiopia and used as a lingua franca by non-Oromo groups, both in Ethiopia and in Kenya. The Boraana Oromo dialect is in number of speakers one of the major Oromo dialects spoken by about 50,000 people living as semi-nomads or as settled farmers in North-Kenya. Most Oromos outside the Boraana area refer to them as the ones who maintained the traditional Oromo cattle oriented life style, the ones with the “purest” language, the ones with the highest skill in poetry. The present study constitutes a synchronic description of the Boraana dialect of Oromo, as spoken in Kenya. It is a data-oriented study and it provides phonological, morphological and lexical material in particular. Special attention is given to the status of wordfinal vowels and their role in phonology, morphology and morpho-syntax. Examples of original texts as well as a Boraana-English and English-Boraana vocabulary are included. 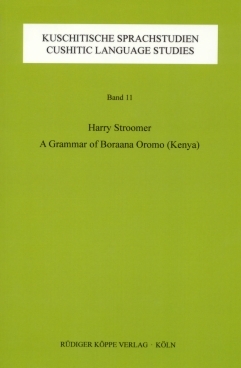 To sum up, Stroomer’s work on Oromo is a major contribution to Cushitic, Afroasiatic, and more generally, to African and general linguistics. Good descriptive grammars are still necessary, desirable, and, in my opinion, worthy of any linguist’s serious attention. Typological and unniversals research has now been further facilitated and advanced by the existence of this authoritative account of the Oromo language. Stroomer is to be congratulated for producing a very useful and enjoyable book.